Out into the Atlantic Ocean, 400 miles from the coast of Senegal, lies an archipelago of islands known as Cape Verde. 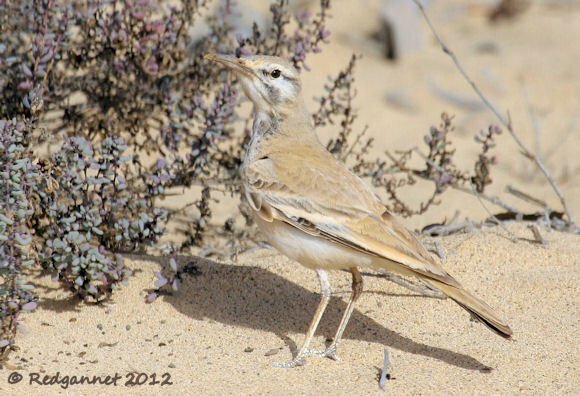 On the most popular tourist island of Sal, I was lucky to encounter the Hoopoe Lark, a bird of desert and dune. 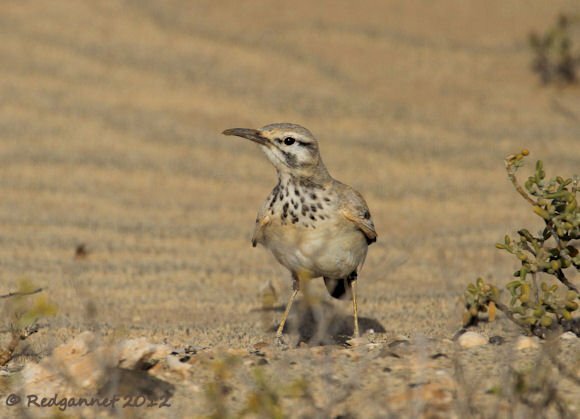 The Hoopoe Lark has only just recently been found to be breeding on the island of Sal, but just on the outskirts of the southernmost town of Santa Maria, it has found the perfect environment in the Dunas de Santa Maria. It is quite possible that it has been overlooked as the ex-Portugese colony is seldom heralded for its birdlife and the popular beaches are the big draw for tourists. Back from the shoreline, the island is noted for being very dry and scrubby; not good for tourist pictures, but great if you happen to be a lark. The scrubby dunes of the Reserva Natural are subject to the constant wind that makes the island so popular for wind-surfers and kite-surfers and the birds can be seen exploring the leeside of any piece of low-lying scrub to find seeds and insects that have been blown into the wind shadow there. They move with darting runs between scrub and succulent, always on the lookout for a meal, changing direction quickly when the opportunity presents itself. 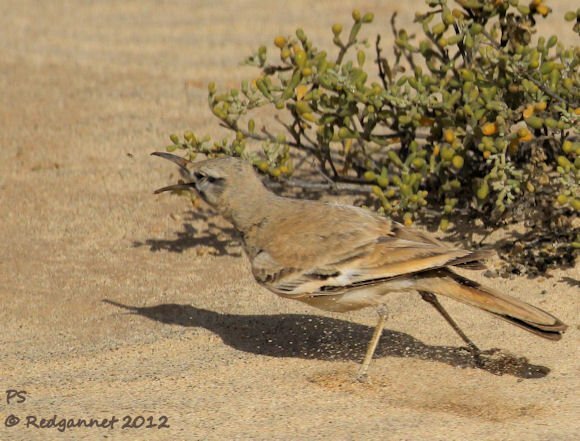 It has been likened to other birds such as roadrunner and mockingbird. With the downcurved bill and mottled chest, I should like to add thrasher to that list. 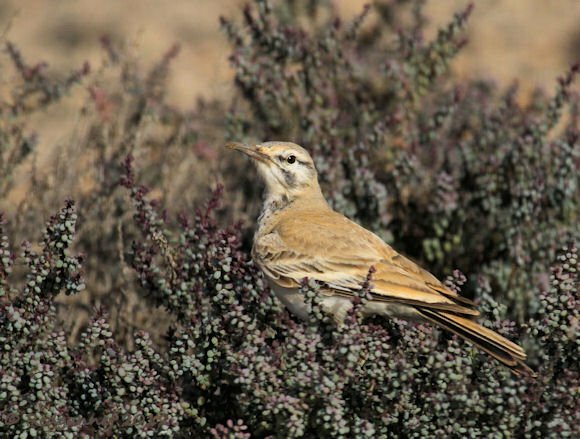 Its name pays homage to the bird that shares much of its distribution across North Africa, The Gulf, Pakistan and Afghanistan. 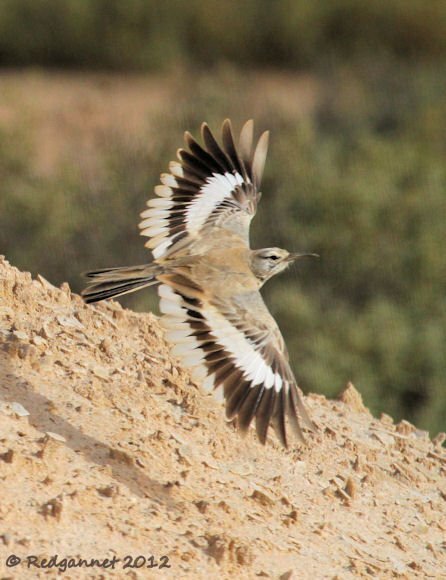 The long downcurved bill is obviously hoopoe-like, but it quickly becomes clear that the name is apt when the lark opens its wings and flies. The Hoopoe Lark’s former range in Cape Verde included the island of Boa Vista from which the third part of the latin trinomial is taken. Alaemon alaudipes boavistae is considered to be the westernmost extreme of the cline that runs extends as far as Asia. The Islands merit some attention from the bird-watching world as there are 6 endemic birds on the archipelago as well as a further 10 species endemic to the island clusters of the region which include The Canaries, The Azores and Madeira. If you are interested to see more posts from Cape Verde and to increase awareness of the islands avifauna, vist Redgannet or follow this link . The hoopoe lark could be easily overlooked simply because it is so well camouflaged against the sand! Looks like a cross between a thrasher, thrush, and mockingbird! 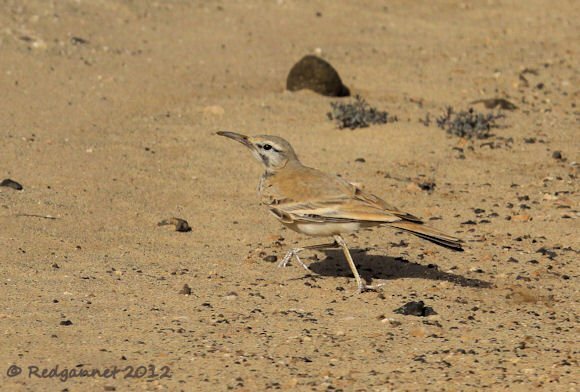 Cape Verde is the place for larks! Beautiful photos. I’d never heard of this bird, and especially like the photo with the shadow. I’m always trying to photograph shore birds with their reflections, and showing the shadow is a nice twist! Niiice. The second pic looks as if you’ve just photoshopped the lark of pic one into it. Well, you haven’t. Or have you??!? Great bird. Haven’t seen it since the late 1980ies. Shameshameshame. Great post of arguably the world’s classiest lark! Well done for highlighting the Cape Verde Islands, a little known birding location yet well worth the visit!